Althea requested a simple romper for her son with shoes and a messenger cap to complete the look. The romper had just a small button at the top, under the collar and short pants for the summer weather. She sent a picture to us as a sample to follow. To date these were the biggest shoes we had ever made but we we just received an order with shoes for a 1 year old. So, here’s the results of the gown with the beads we were working on. The back of the gown shoes the buttons with the beads attached. The bonnet has the chiffon fabric and beading over the satin. The beads were hand sewn onto the bodice neckline and sleeves. 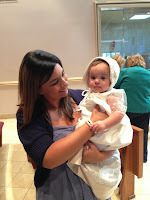 The swoop of beading down the side of the wedding gown was also used in the skirt of the christening gown. The shoes have an organza ribbon tie and the beads sewn into a flower on the toe. Our customer came to us with her wedding gown and an idea to have 4 wristlets created for each of her daughters and daughters-in-laws to use on their wedding days. 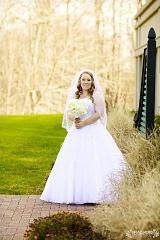 We designed 4 different ones using different parts of her wedding gown and the lace on her veil. The flowers on one of them came from her headpiece. 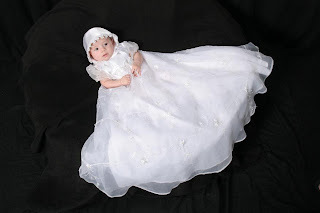 She had also wanted us to keep enough of the gown intact so that she could have other things made down the road…a christening gown…a teddy bear….etc so we only took fabric where we normally don’t use for a gown. We used a PUL fabric for the lining because Jayne thought they could be used as makeup bags later on. We also used the swivel hooks so the straps could be removed. We think this is another great way to recycle wedding gowns! 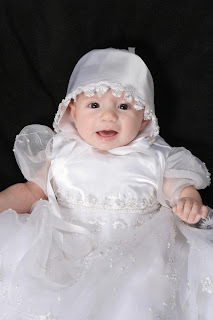 Mom came to us with her dream of having her son’s Christening outfit made from her gown with shoes, along with a girl’s gown and a pillow to dream on for her own special day. It was mom’s request to not only have the Christening date put on the bottom of his shoe but also embroidery little crosses on the toes. What a great idea! We also embroidered the wedding date on her pillow as a memento of her own very special day. 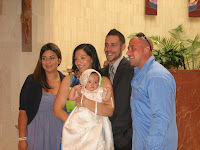 What a great family, it was such fun to meet them…and especially “grandman” who was thrilled with the girl’s gown. We used the heavily beaded area of mom’s gown as the bodice of the gown. The embroidered train gave us lots to work with for the pillow, vest of the boy’s outfit and bottom of the gown. There was enough plain satin for all the rest. Angie & I have made the local paper with an article about our business, how we got started, etc. We’re on page 20 of Section 2. CHECK IT OUT!!! 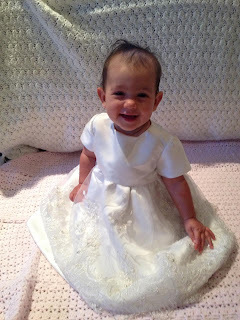 Pictures of baby Olivia in her “one of a kind” christening creation. Our thanks to mom for sending us pics of her little cutie. There was another family in the church who were impressed by her gown and asked where she got it and mom passed on our information. Thanks Jacqui! 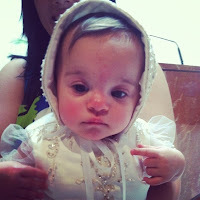 Hi Sarah and Angie,I’m sending you along a picture of Morgan from her christening. We were so pleased with the gorgeous dress, and I can’t even count how many compliments we received on it. Everyone was truly amazed by what a beautiful job you ladies did. Thank you for helping to make her day even more special. Thank you Jessica for sharing Kaitlyn’s special day with us through these pictures. 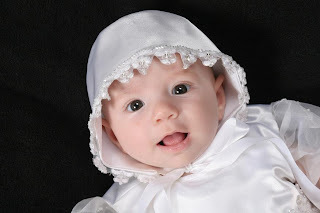 She looked adorable in her gown and bonnet. Also for the glimpse of what a beautiful bride you were in your gown & veil. Your kind words mean so much to us!